George Carlin had many good lines, and this is one of them. 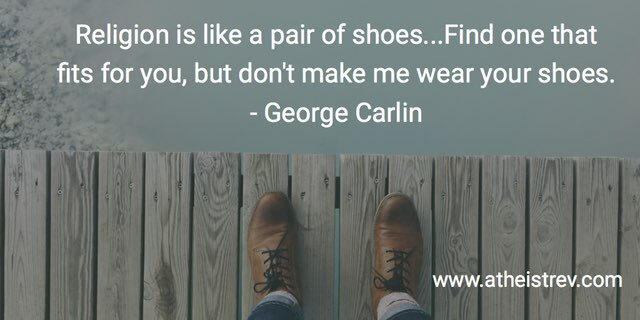 Religion is like a pair of shoes...Find one that fits for you, but don't make me wear your shoes. People don't typically choose religions like they pick out shoes, trying on several until they find one that fits. It is far more common to latch on to the particular religious tradition in which one was raised. But the basic point is relatable in the sense that most religious believers will tell you that their religion fits or that it is the "right" one. And perhaps it is the right one...for them. Religious believers have every right to select their own religion; they have no right to impose it on the rest of us. It sure would be nice if more religious believers would figure this out. They could maintain their beliefs and even share them with others, but they'd refrain from pushing them or using state power to promote them. And most of all, they would not attempt to govern others based on them. I suspect that the world would be a much better place if we could somehow reach this point.